Eraser for Android can scan all the existing and deleted files on your Android device and then erase and overwrite them. These files include contacts, call logs, text messages, photos, music, videos, documents, calendars, notes, Apps, books and much more. In addition, your private data like Google history, snapchat history, accounts, passwords, transaction records, financial data, browsing history, etc. will be wipe off also. All these erased data are unrecoverable. The Android data eraser App is equipped with succinct interface and easy-to-understand instructions. No matter you are a master or novice of technology, you can handle it with ease. 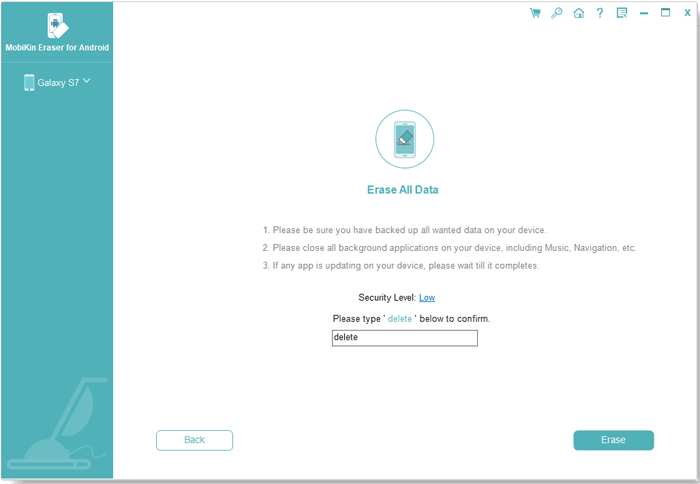 To complete the erasing process with this tool, you only need 3 steps: connect your Android device to computer > select an erasing level > erase the device. It provides 3 security levels for users – Low Level, Medium Level and High Level. Among them, Low Level is the fastest way to erase and overwrite Android device. 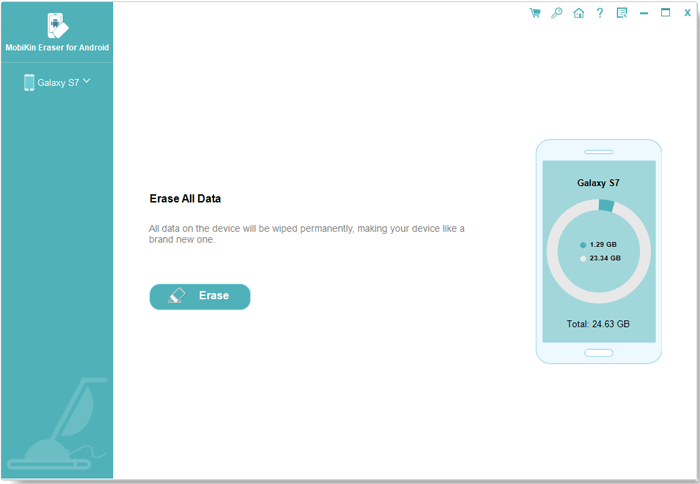 Medium Level will remove and overwrite all your existing and deleted files with random data one time and High Level will overwrite your device 3 times, leaving no chance of recovery. The tool supports all popular Android devices on the market, including Samsung, Xiaomi, Huawei, LG, Motorola, HTC, Sony, ZTE and more. Generally speaking, if your device is running on Android 2.1 or above, you can use it to wipe off your phone data without restrictions. How to Erase Android Phone Permanently? Step 1. 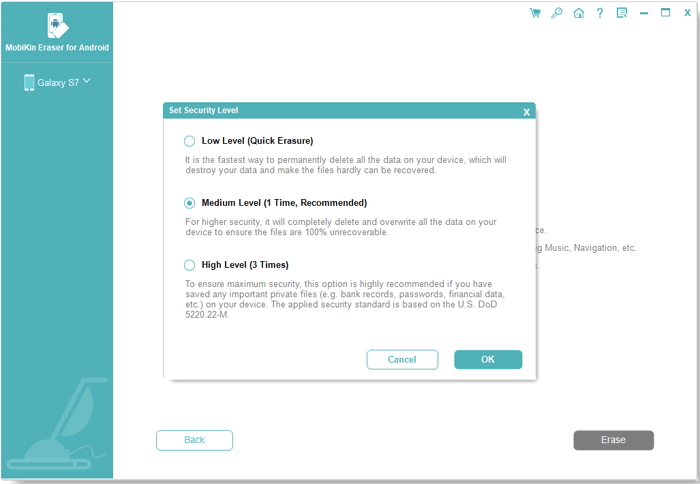 Download, install and launch the program on your computer and then connect your Android device to the PC and go with the prompts to make the device recognized. Step 2. On the primary interface, please tap on “Erase” > “Medium” to choose a security level and confirm your option by clicking “OK”. Step 3. Now you can type in “delete” in the blank box and tap on “Erase” to begin erasing all data from your Android device. Now MobiKin Eraser for Android is available for Windows and you can choose to purchase the 1-year license ($29.95/PC) or lifetime license ($39.95/PC) freely: https://www.mobikin.com/purchase/buy-eraser-for-android.html. What do you think of MobiKin Eraser for Android? Please leave your comments below!